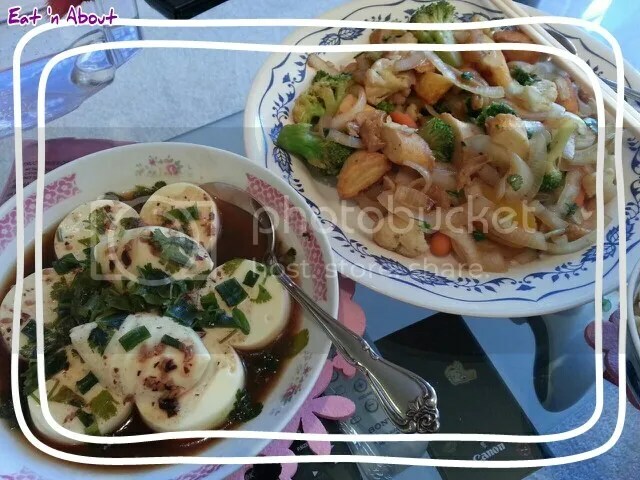 Another reason why I cook so often is simply…I find my stuff is more tasty than Hitman’s!!! I much prefer Chinese cooking than Caucasian, but we do have pasta quite often as it’s very easy. I would like to share more of my cooking on here..it’s not easy as it’s difficult to take pictures while you’re busy stirring or chopping and your hands are all dirty. But here’s a start. Note: I got the Mochi Fishcake at T&T Supermarket, where you get the various hotpot fishballs and such. I think this is their creation. You can for sure substitute any other ‘meats’…this particular night this was the only easy-to-thaw ‘meat’ I had on hand. (Again, I didn’t measure the condiments…I just splashed them on to taste). Soak the dried shrimps in a little water till tender and cut in half. Save the water. Spray pan with olive oil spray and heat on medium. Meanwhile, microwave frozen veggies according to directions (4 mins for me). 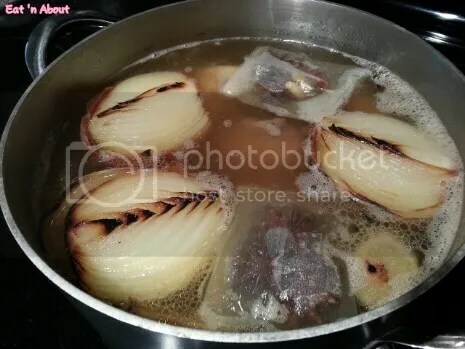 When pan is hot, add onions and cook til tender. Add dried shrimps (without water) and heat till fragrant. Add fishcakes and stir till hot. Add microwaved veggies. Stir till hot. Add the Somen sauce and low-sodium soy sauce and the shrimp water. Cook until everything’s heated through. Bring a pot of water to a boil for steaming. While waiting, cut open package of egg tofu and slice into 3/4 inch rounds. Assemble on a platter. Mix together garlic black bean sauce, cold water, and corn starch. 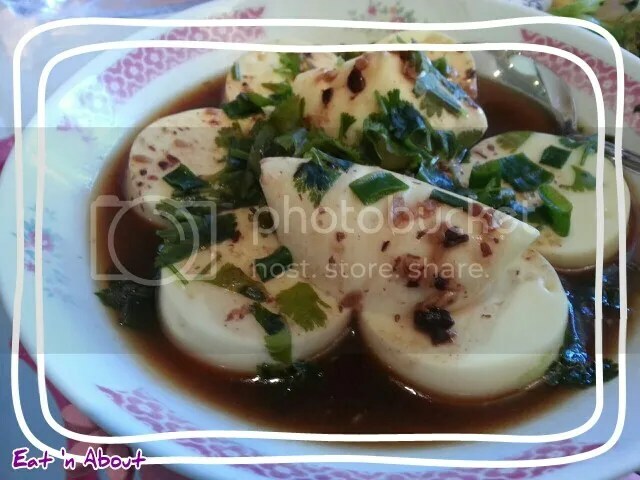 Pour onto the egg tofu rounds. Sprinkle half of the green onion and half of the cilantro on top. Save the rest for afterwards. When the water is boiling, place the platter into the steamer and steam for 15 minutes. After 15 minutes, take the platter out and sprinkle the rest of the green onion and cilantro on top. 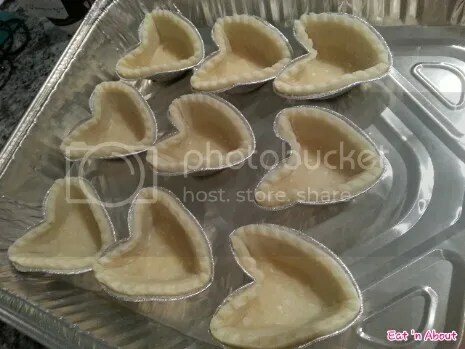 The cute heart-shaped tarts I posted on V-day were something I made for Hitman. The recipe’s from one of my all-time favorite blogs The Art of Doing Stuff authored by the uber hilarious Karen. She is always so funny and witty. Take a peek at one of my favorite posts from her and tell me you did not just blow milk (or anything) out of your nose when you get to the picture of her holding the potato. 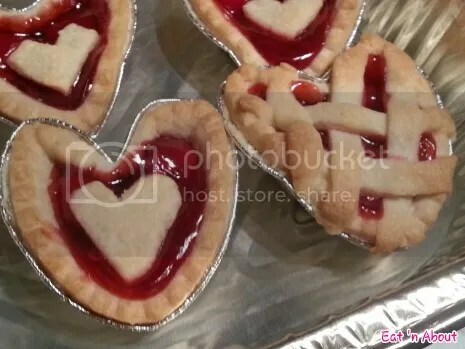 Anyways I came across this post from her last year and it’s an easy-peasy recipe (it’s really not even a recipe…more an assembly job) for the cutest, loveliest mini heart shaped cherry tarts. 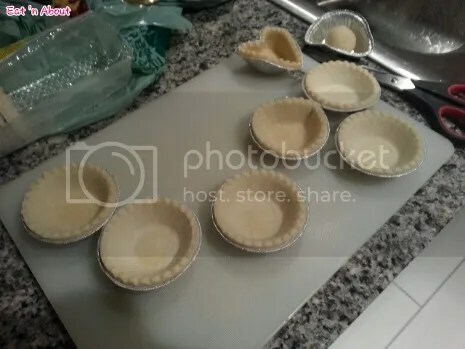 I used the 3″ tart shells, not the mini kind. Take shells out and let them thaw a bit (about 3 minutes) so that they’re malleable. 3. Dent the foil and gently mold each shell into a heart shape. Then fill with the pie filling. On the hunt for bones to make pho with our usual location was all out, so we decided to check Al-Salam Halal Meat. I phoned ahead (twice) to confirm price and stock etc. and both times was greeted by a very friendly sounding man who called me “Brother” after every sentence. I could hear some bustle in the background of the calls, but it didn’t prepare me for all the stuff going on when I arrived. Various butchers cutting huge slabs of meat to order, people standing waiting around the store, guys coming in to pick up orders, people coming up and down from the grocery store upstairs (which I didn’t get a chance to explore this visit) etc. I’m guessing they serve a lot of the restaurants in the area since there are many middle eastern and African restaurants that must create a significant demand for Halal products. I found the shank bones fairly quickly, already prepackaged and cut up into discs and only 2/3rds of the price we had been paying elsewhere! I love pho…I would have it everyday if I could. Now it’s not the most expensive meal in the world but it would be such an accomplishment if I could make it myself… So off to the inter webs I went in search for an easy recipe. My first attempt at making any kind of bone broth was actually the Korean version. 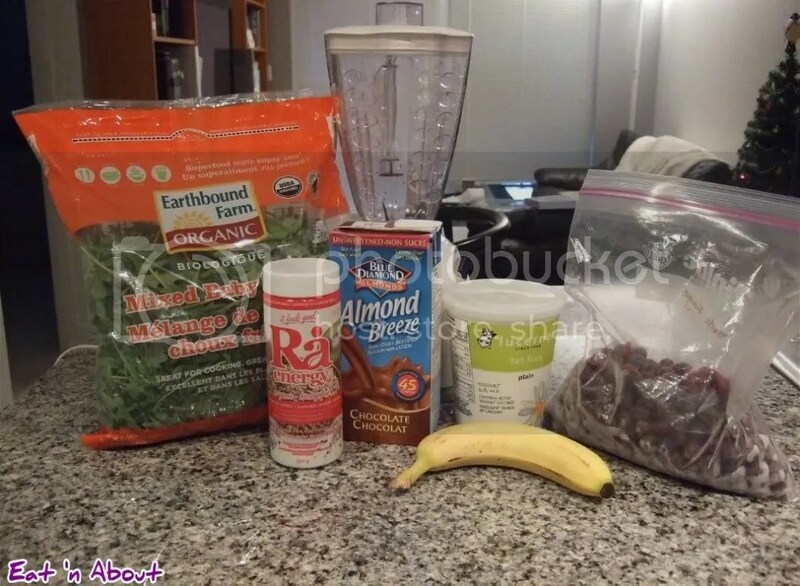 It didn’t require a lot of ingredients, but it does require a lot of time…2-3 days actually. What results though is a rich, white broth full of gelatin and collagen…recipe for that coming soon. Anyway back to pho…it turns out pho soup base is less time consuming to make, but takes just a bit more ingredients. If you’re Asian, you should already have most of the stuff in your cupboard. 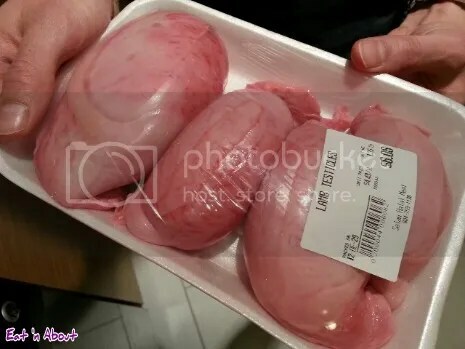 I grabbed a great recipe off Viet World Kitchen….it’s great cuz it’s seems to be the easiest with the least amount of ingredients. 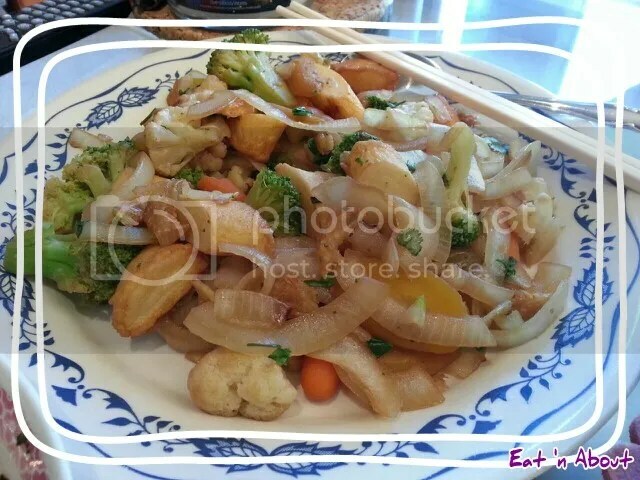 However I found that the pictures from Steamy Kitchen and Inspired Taste to be a great resource and they would be especially helpful to those of you unfamiliar with certain cuts or meat, spices or bones.